Every step along my journey recovering from postnatal depression was a small step. So the first step for me was making my porridge in the morning. I was mixing 1/2 cup of oats with a teaspoon Panela (a sugar cane from Colombia that helped build my milk supply), and cooking with 80g milk and 60g water for 7min/90 degrees/reverse speed 2. 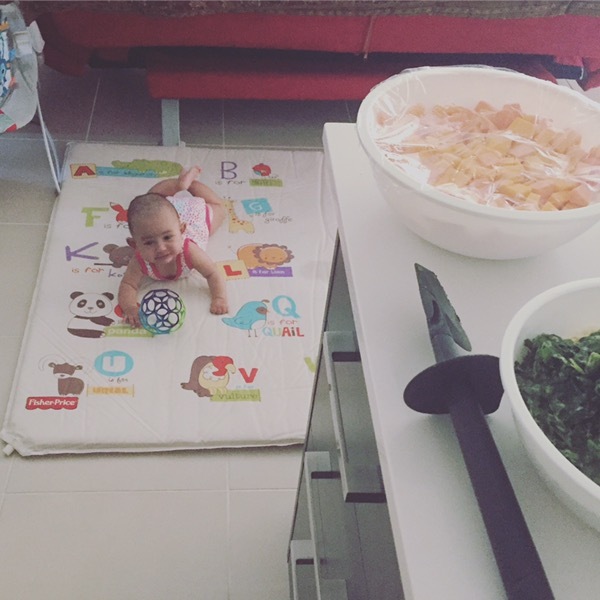 Being able to “set and forget” helped me cook my breakfast while dealing with a clingy baby. I still have porridge every morning but now use oat milk and after it has finished cooking I throw in a apple chopped in quarters, a dash of cinnamon and a tablespoon of LSA mix. Then I mix for 5sec/speed 5. Not only does this save me the hassle of stirring it all together but it also helps with the cleaning process after. I also had zero interest in eating lunch let alone making it! So to ensure I ate lunch I started cooking big dinners so I could have the leftovers. I wasn’t eating snacks during the day and then when my energy levels would crash I would reach for the chocolate. I had stopped eating chocolate during my pregnancy and it didn’t take long before I was a chocoholic again. I would be exhausted by the end of the day and cooking dinner just seemed to hard. But I started making “all in one” meals like the chorizo pasta and rice salad from the Basic Cookbook, spinach and ricotta patties and the beef stew from the Everyday Cooking for Thermomix Families and the non-fried fried rice from the Recipe Community. Not only were these recipes easy to make they also made big serves so I had my leftovers for lunch. This was also great because during this time I was really struggling to make decisions and choosing what to have for dinner had really stressed me out. And using the Cookidoo meal planner really helped me through the overwhelm and decision fatigue, plus it was so easy to use I often did it while breastfeeding. When I finally realised I had postnatal depression I reached out to a few friends and family who were full of support and advice. A naturopath friend advised me to stay away from sugar and stick to whole foods. I did my best but the bags of chocolate would sneak their way back into the pantry again. It wasn’t until Maya’s eczema was getting really bad and we were told her cradle cap was severe and should have cleared by now that things really changed. Three different people had told us that eczema was caused by an allergy to milk protein (Gluten and eggs are the other common allergies). Neuroscientists say we need to hear something three times before we believe it and I guess that was true for me. So on 1 December I cut dairy from my diet. This was when I switched to oat milk in my porridge. I’m not a coffee or tea drinker so I didn’t think cutting dairy was going to be that hard but I had forgotten about all the cheese I eat! We used essential oils to calm her skin while we healed her gut from the inside. During the three weeks it takes for dairy to be completely out of my system we saw improvements in her eczema, her reflux and her crying. She was a much happier baby by the end of the three weeks. And because I had cut dairy I had also gone cold turkey with my chocolate addiction which was my main source of sugar. The brain fog started to lift which was also helped by my getting more sleep because Maya was sleeping better now. I was slowly able to function again. With the help of counselling, essential oils and kinesiology and my whole foods, dairy free diet I was able to lift myself out of the darkness of postnatal depression. I’m now enjoying every minute with my beautiful baby girl, I feel energised even when I’m up all night with her, and I no longer feel overwhelmed when I step into the kitchen. I’m making yummy dairy free treats and when I make nut milk I save the nut pulp and use it in place of chickpeas to make hummus. My Thermomix journey has evolved so much since I first started and it’s set to evolve once more. Being a first time mama I had no idea how hard motherhood was going to be. I’m so glad I had my Thermomix to help in the kitchen and help improve our health. It really is more than just a cooking appliance! If you have any tips on solids or dairy free cooking please comment below. If you would like to know more about Thermomix, hosting a cooking experience or 24 months interest free (ends 2 February 2017) and you live in Perth please email me at tash@thermotash.com.au. 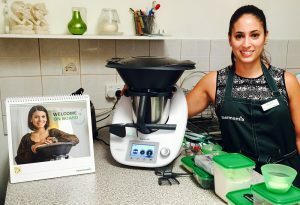 If you live elsewhere go to the Thermomix website and they will connect you with your local consultant. If you think you or someone you know may have postnatal depression take a look at the Edinburgh Postnatal Depression Scale quiz here.